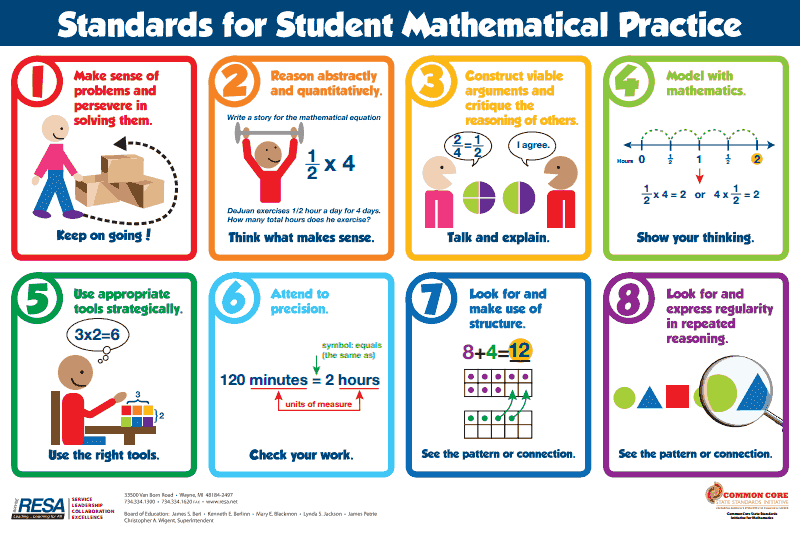 The Standards for Mathematical Practice are a significant focus of teaching math. They are a set of eight practices that describe the thinking processes, habits of mind, and dispositions that students need to develop a deep, flexible, and enduring understanding of mathematics. I can re-read the problem. I can try to solve the problem in a different way. I can make connections to other problems. I can try to understand other’s strategies. I can represent and solve a situation mathematically. I can check that my result makes sense. I can justify my reasoning. I can find errors in mathematical reasoning. I can use examples to explain reasoning. I can use tools such as diagrams, tables, flow charts, and formulas. I can apply my models to real world situations. I can understand the limitations of a calculator and its benefits. I can bring my materials to class daily. I can use the online supports as a resource when necessary. I can clearly communicate using math language. I can calculate accurately and check my work. I can find patterns in my work and make generalizations. I can break down larger problems to solve. I can look for and use efficient math strategies and rules.